Most people think of “Shop SmallⓇ" as the rallying cry to encourage communities to support the mom-and-pop retailers in their towns. But local service-based businesses can be a part of the Small Business SaturdayⓇ (the Saturday after Thanksgiving) excitement, too. If you’re in the business of providing services rather than products, get ready to gear up for this year’s Small Business Saturday (November 24) with the following ideas for promoting your brand. 1. Partner with a local retail business. Explore opportunities with a brick-and-mortar retail business that offers products that are somehow related to your services, and agree to cross-promote your companies as Small Business Saturday approaches. Even if there isn’t a nearby retail business that’s a direct complement to your services business, you can still explore a marketing partnership based on your shared experience of serving your local community. 2. Find creative ways to support each other in the spirit of Small Business Saturday. What you do to help each other in the name of Small Business Saturday will be a collaborative effort. Plan some time to talk it over and get creative. Agree to raise awareness of each other’s businesses via social media in the weeks leading up to Small Business Saturday, and place your print marketing materials at your retail partner’s location. Consider offering your retail partner’s customers an exclusive deal or enter them in a drawing for a free consultation (or some other perk that will introduce them to your services). Be present at your retail partner's location to help on-site that day by welcoming customers, providing complimentary refreshments, or assisting with any other Small Business Saturday activities planned for the day. 3. Promote the Shop Small movement on your digital marketing channels. 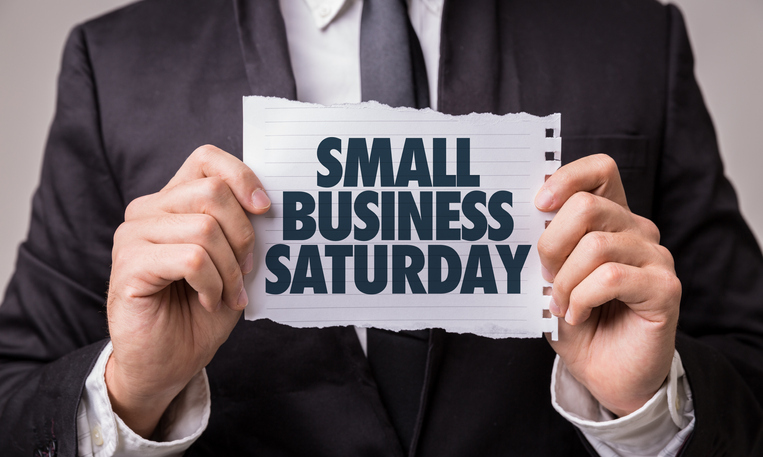 Generate buzz about Small Business Saturday through your blog posts, email marketing, and social media channels. By raising awareness of the impact small businesses have on their communities, you can help motivate people to shop small not only on November 24 but also all year long. Remember to emphasis that your service-based business is a small business, too, and you uphold the standards of customer service excellence and uncompromising quality that are characteristic of small businesses. The site also provides templates for print collateral and tip sheets to help successfully use all of the tools available there. As I mentioned earlier, if you coordinate Small Business Saturday efforts with a local retail business, social media is a wonderful way to support that partner. In your social media posts, use the hashtag #shopsmall to facilitate engagement from other small business advocates. To expand your reach, consider putting some money toward online advertising. Facebook ads and promoted posts are especially cost-effective, and they enable you to zero in on your ideal target market. As a public proponent of Small Business Saturday, it’s important to not only encourage others to support small businesses but also to show that you practice what you’re preaching. In your marketing efforts online, consider including brief video clips of your visits to local retailers and tagging businesses in your social media posts to give them kudos and more exposure. By actively doing business with local companies and calling them out for a job well done, you’ll generate goodwill and put yourself in a better position to receive referrals from them. Best of all, those benefits can stretch far beyond Small Business Saturday. This year’s Small Business Saturday is just around the corner, but it’s not too late to boost your service-based business by acting on some of the points I’ve mentioned. By taking the initiative now, you can lay a firm foundation for your Small Business Saturday success next year, and the next, and the next. The key is to make “shop small” a permanent part of your company culture year-round—after all, any time is the right time for supporting small businesses and celebrating their contributions to our communities. Nellie Akalp is a serial entrepreneur, small business advocate, speaker and author. Nellie has been named a Top 100 Small Business Influencer by Small Business Trends the last five years and CorpNet.com has been recognized on the Inc. 5000 list of fastest-growing privately-held companies in America in 2015 and 2016.